According to an article in the Ottawa Citizen, the National Capital Commission is looking to get involved with the City of Ottawa to offer some input into Ottawa's light-rail transit stations during the upcoming design process. “As they were explaining the project to us, with the 13 stations, it just seemed like such a wonderful opportunity to put a national or a capital component to it,” Lemay said. The transit system will be a “capital-changing” project, she said. The fact that there are to be 13 transit stations along the LRT line, the same number of provinces and territories within Canada, is an intriguing coincidence--adding in some design element bringing that home would certainly make for a nice train ride through the core. And although the NCC has said that their offer doesn't come with further funding (they're offering their "expertise" and an ability to connect with the whole country) it's probably not too much to think that provincial and territorial governments may be interested in investing in "their" LRT stop along the line. 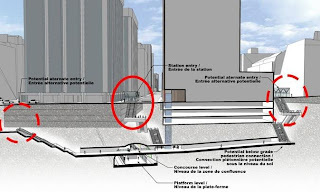 Perhaps not significant investments, but even a small amount of funding to help improve the aesthetics of the station could allow Ottawa to have some terrific-looking stations without breaking the bank on the design aspect. Still, the blog Maple Manifesto--a newcomer to the Ottawa blogging scene--is wondering why the NCC is looking to have input in the City's infrastructure affairs when they aren't always willing to cooperate with the City in other areas. 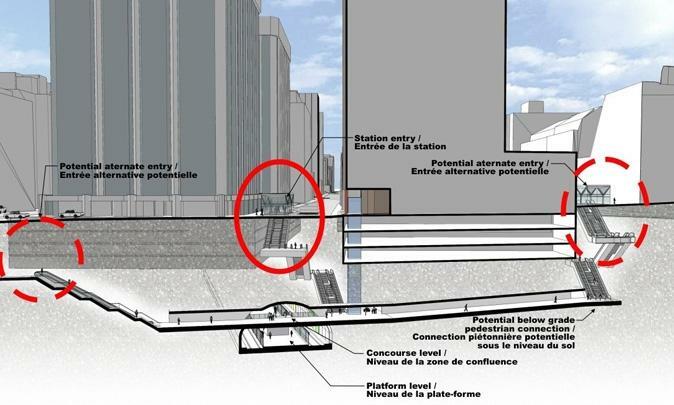 The image at the top of the page (click to enlarge) is of the projected 'Downtown East' station--in the middle of the downtown tunnel, tentatively slotted right in front of Parliament Hill (or within a couple blocks, anyway), and likely the stop most tourists will be disembarking at in order to get to events in the area. Of all the stations the NCC might get involved in, this seems the most likely for them to invest into. And, if we go from west to east along the line as we do with provinces (relegating the territories to the eastern portion, for arguments' sake), Tunney's Pasture would be British Columbia, and Downtown East would be--you guessed it--Ontario. That's not what I want to type, but this is a family-friendly internet thingie. Don't you have more flagpoles to put up or something?